To inspire the young people in my assigned area, I thought of getting them involved in a Singing Ministry where we would visit area churches to give concerts. 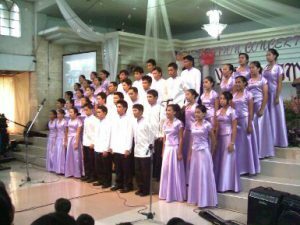 Once we got started, the young people got involved not only in singing, but also in leading out programs for Sabbath School and AY programs.Church concert in Mindanao. Our choir practiced for weeks and before we started giving church concerts, we had a spiritual retreat to reinforce their commitment to the ministry. Our Spiritual retreat culminated with the commitment ceremony and candle lighting in which we gathered around our choir Logo, to place our candle with an oath to dedicate ourselves to the singing ministry. And Indeed God is so good – we chose 47 dedicated young people for His service – to sing for His glory. 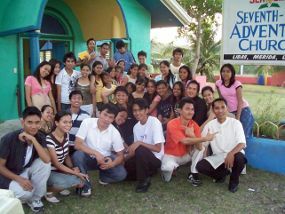 I praise the Lord for the success of our ministry here in Ormoc City. Indeed the Lord is great and powerful, working miracles in so many ways. Stage performed by the Adventist Choir. A dedicated Pastor Melvin Garin who coducted a singing group. We had just successfully held our Celebration CONCERT last Sept. 19 and it was really inspired by God’s Power. I am so grateful to God for the wonderful and grand event. My gladness is beyond words. I would like also to extend my gratitude to AMI and to my sponsors: the Trevor family for the financial support that they had given for our choir uniforms. 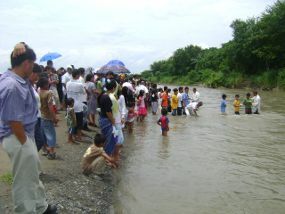 By Robert GuelosMass baptism in Southern Mindanao. 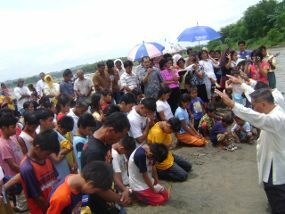 Our crusade in Tinagacan ended this Sabbath. This place is very challenge for us because the community is a mixture of Muslims, Bla’an and Christians. Last year when we camCrusade in Tinagacan Southern Mindanao results to 70 souls.e to do evangelistic work here, there were no baptisms, but praise the Lord this time, we have 70 precious souls who accepted Jesus as their Personal Savior. Last year we had no budget but this time we had a free clinic during the opening of the crusade and many people came. Praise the Lord!